Are you looking to eradicate bugs and ensure consistency? SSW CodeAuditor is a code analysis tool that allows developers to take control of your code, ensuring large, complex source code can be simplified, cleaned and maintained. 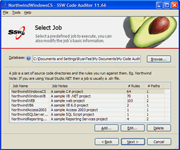 The built-in rules focus on the most popular .NET languages (C#, VB.NET) for both Windows Forms and ASP.NET; however, the flexibility of SSW CodeAuditor allows the developer to add their own rules to target any language in any text file. As a project or company grows, managing code standards throughout your team becomes virtually impossible. Consistent code is crucial to future development and maintenance. 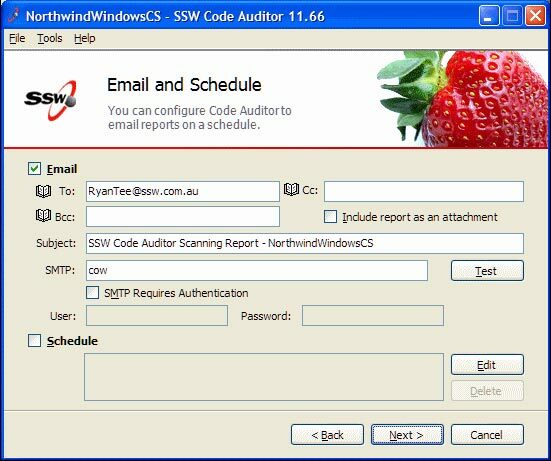 SSW CodeAuditor lets you take control of your code and automatically review your web apps and projects - giving you more opportunity to spend time where it really matters. Here at SSW, we face the problem of maintaining our standards across nearly five thousand web pages, over twenty active projects in both Visual Basic (6 and .NET) and C#. 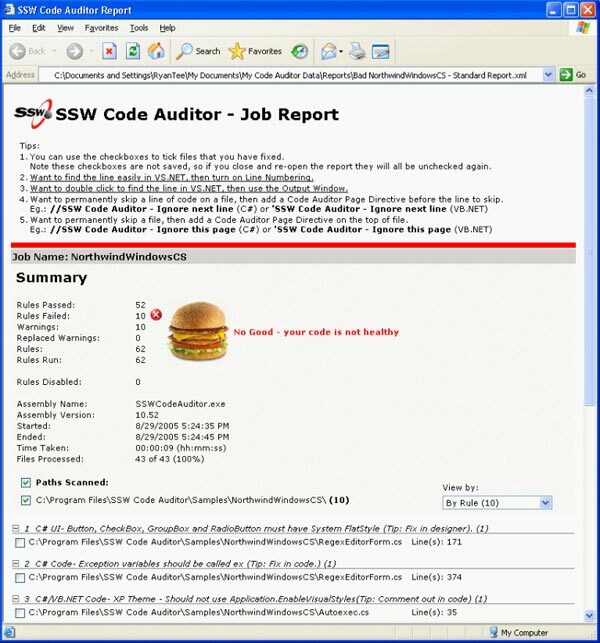 There comes a point where a tool to check our work is needed, this tool is SSW CodeAuditor. SSW CodeAuditor utilizes the power of Regular Expressions and the new Roslyn compiler to audit your code. This powerful feature permits the user to write their own set of rules and have different rules for different projects. 2 methods to keep your code healthy! Great, user-friendly wizard style interface. With our standards compliant user interface, you are sure to have a consistently great operating environment with SSW products. Make your own rules! With our powerful regular expression enabled parsing engine, you have the flexibility to scan any text file for any kinds of rules. Rules can check specific filetypes and have exceptions based on other regular expression matches. Stay on top of things. CodeAuditor has in-built scheduling and email notification functionality so you can have regular reminders of what needs attention in your projects! Spanning the big picture. Scan any number of directory trees with extensible path selection. As many development projects can be covered by your rules as you wish. Report Output. 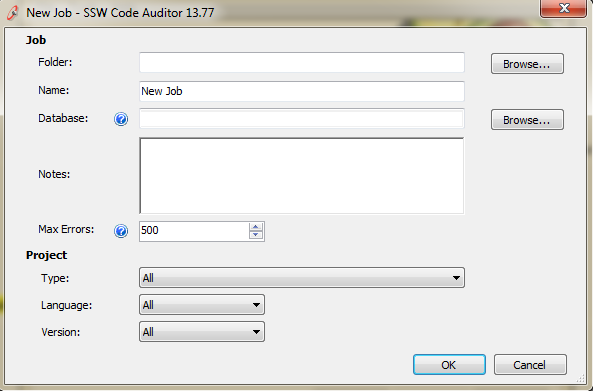 See a sample good report from the CodeAuditor process. 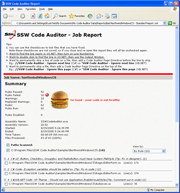 See a sample bad report from the CodeAuditor process. 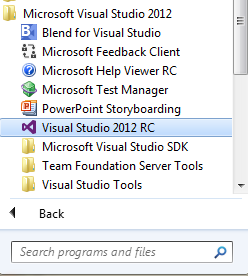 Visual Studio Team Foundation Server Add-in. Automatically adds an additional Check-in policy that runs SSW CodeAuditor and stops developers from check in code that violates rules. Built-in sample projects & sample database. We offer a sample database and kinds of sample projects to help you run a professional demo scan. Scan websites for HTML that violates your rules - including the information served by the web server! Do they go in CodeAuditor or Link Auditor? Windows Form should have a minimum size to avoid unexpected UI behavior. See Do you keep a minimum size in the window forms? for more details. 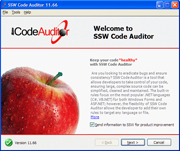 How to show your application is 'SSW CodeAuditor' Compliant? To show your users that you have taken the care to create a 'healthy' code, you may display this image on any web pages and applications that are validated by CodeAuditor. You can also download it in .png or .gif formats. Where should I put this icon? We recommend the image to be placed on the footer (for websites) or in the "About Box" (for WinForm applications). If you can't find it in the product documentation, then check our knowledge base for further information and tips about this product. If you think that one of our rules is incorrect, please tell us about it. 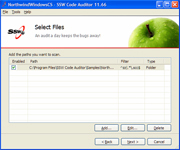 SSW CodeAuditor is similar to Microsoft FxCop but has some important differences. FxCop has a good set of rules however writing your own rules is not in the UI... and not many developers go to the trouble of delving down and writing their own assemblies. Consequently they just stick with the rules they are given. FxCop works against compiled assemblies only (it uses MSIL to get information about the code). SSW CodeAuditor on the other hand looks at the source code itself. This means you can worry about the code formatting and comments. FxCop only works against .NET assemblies. SSW CodeAuditor on the other hand works against any plain text files. So now you can write any rules against any files in the solution. Overall FxCop rules are good - however many are obscure (Eg. we do not worry about the Globalization rules, Mobility rules and Portability rules). SSW CodeAuditor on the other hand has rules that are more 'general developer' oriented. In addition SSW CodeAuditor provides many rules to improve your User Interface. 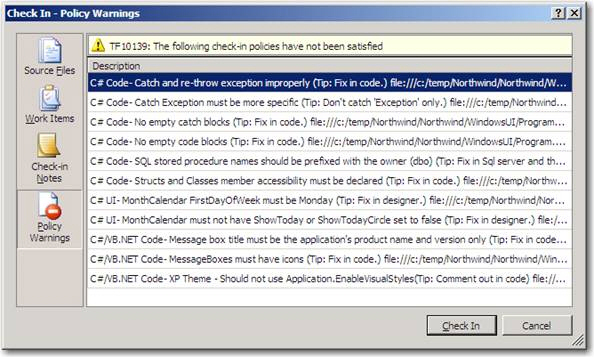 For most users FxCop rules are fixed (unless you want to build a .NET Assembly). 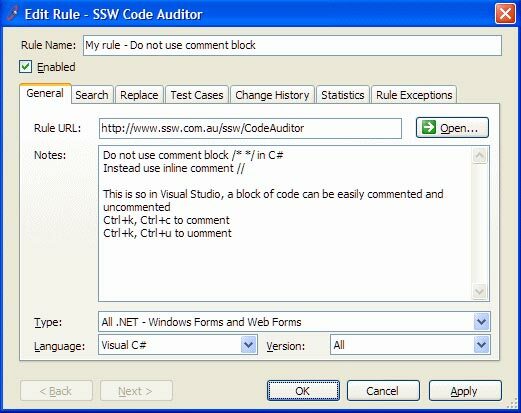 SSW CodeAuditor rules can easily be extended using regular expressions. Out of the box FxCop only provides one type of report in xml. 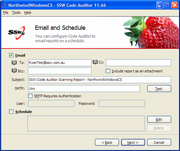 SSW CodeAuditor on the other hand provides a report that is flexible and shows the data in different views. Both can be scheduled via a command line. 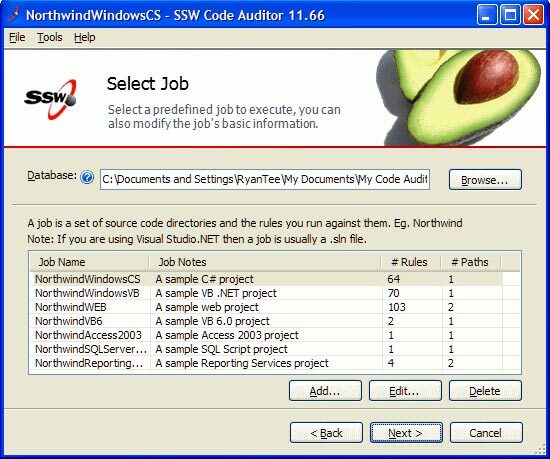 SSW CodeAuditor's wizard makes it real easy to help you keep your code projects clean all the time. 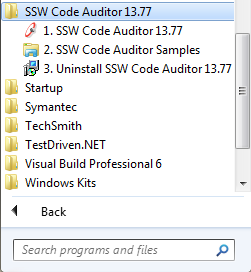 SSW CodeAuditor includes a VS.NET Extension, which encourages you to use both within the VS.NET environment.